Fareha is a Senior Account Manager at AprilSix Proof (formerly Proof Communication) where she provides PR and communications support to a wide range of science and engineering clients including numerous Innovation Centres and European megascience facilities. 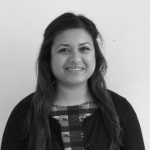 Prior to her role at Proof, Fareha worked in healthcare and pharma communications covering various therapy areas including diabetes, hepatology and infectious diseases. Follow Fareha on Twitter. Fareha studied Biomedical Science at undergraduate level and holds an MA in Science Journalism.